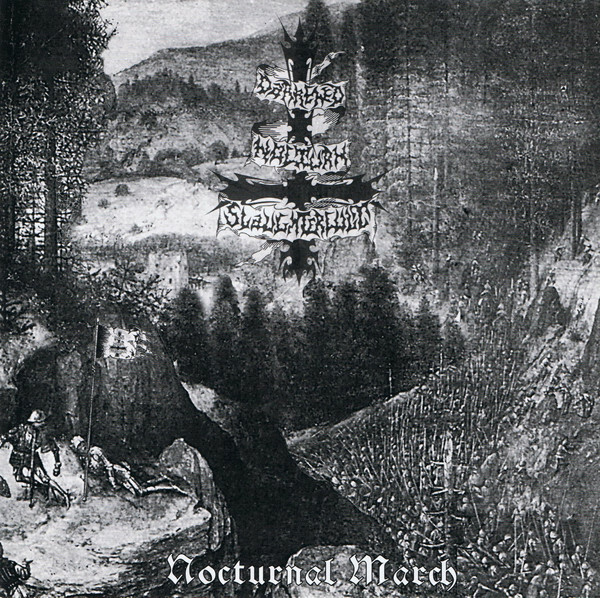 And with “Nocturnal March” the German black metallers Darkened Nocturn Slaughtercult delivered their third opus. And I was pretty curious what this would bring, for I really liked “Follow The Call For Battle”, a raw and slightly thrashy (mainly in the production though) black metal album. Earlier this year I reviewed the split LP with Donkelheet and there I heard a totally different band. More eerie, more hollow, slower … it leaned a bit more to bands such as Forgotten Tomb and Burzum, not really bad. But after the first song of “Nocturnal March” it is clear that the change they made on the split LP was a one-time event (probably to fit more into the style of Donkelheet, so the LP would sound a little more coherent). At the first quick listen I thought they slowed it all a little down compared to “Follow The Call For Battle”, but when I spinned it for a couple of more times it wasn’t the speed that has been changed. The atmosphere has taken a more important place on the album than it did before – or, it just worked out better this time. The main reason for the atmospheric feeling to this album are probably the ambient parts that are built in, every now and then a nicely arranged and haunting piece of dark ambient is woven into the rest of the music. Especially the strange creepy whispered and mutilated voices in these ambient tracks are brilliant, for instance in “Whispers Of Arcane Cimonar”-track (at least on my CD, see my comment later on in this review). Another important thing is that the album sounds more coherent than ever before – it sounds a lot more like one album than the previous one did. Further more the production seems to fit better this time – though, this is the same producer that recorded all previous Darkened Nocturn Slaughtercult material. A less thrashy approach and a more raw/harsh twist makes the songs sounding more black metal than they did, funny thing is that I didn’t experienced this while listening “Follow The Call For Battle”, that is the good thing of being able to compare.